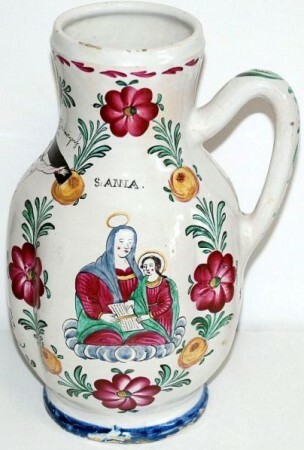 The Apostles (who are all saints) in relief around the body of this circa 1890’s majolica serving pitcher. 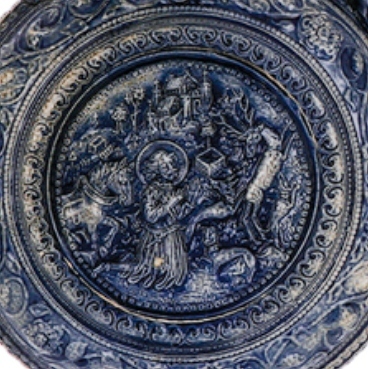 The small relief figures in white above the saints are the Zodiac signs, and the flaming heads are angels I believe, whether “Thrones” or “Seraphims” remains to be determined. 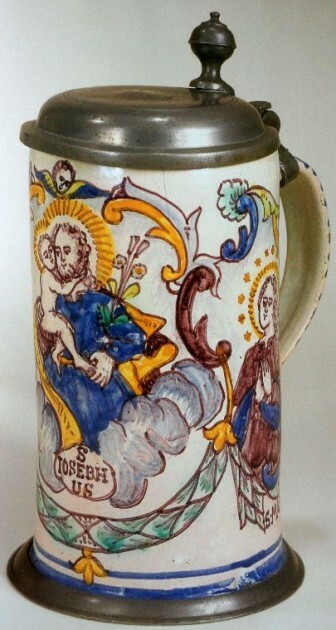 Apostle steins (Apostelkrug) – Early pottery steins made in and around Kreussen (also Cruessen), Germany, in the mid to late 1600’s. 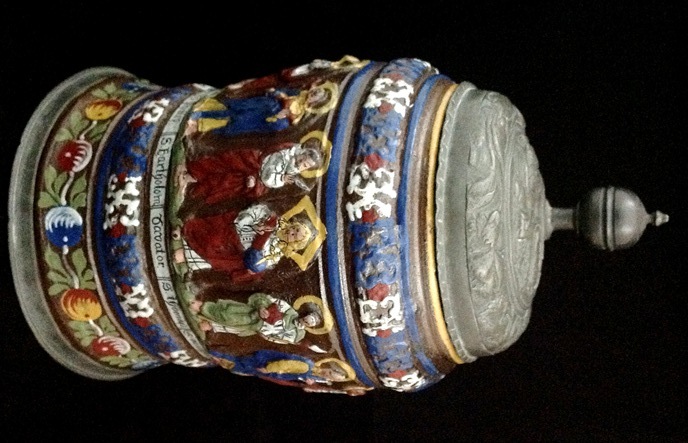 The relief and enameled figures celebrated the 12 Apostles and Jesus. 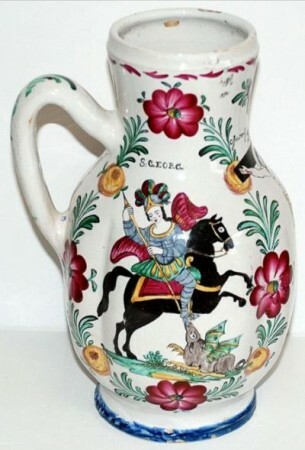 Highly collectable and very, very reproduced over these many years. 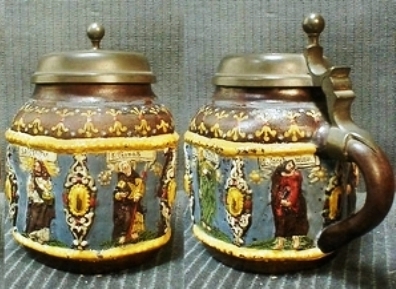 Shown far above: A 6 inch, to the top of the lid; an authentic one; most are larger. 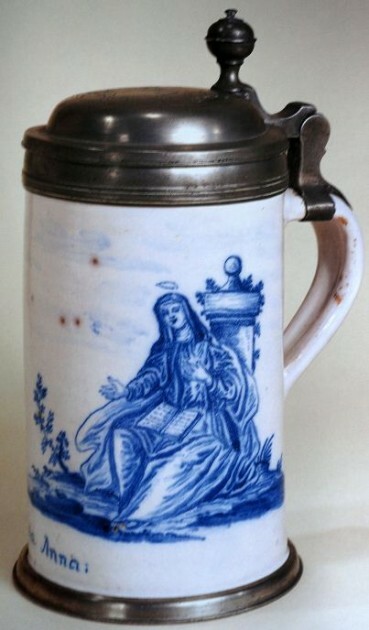 Dated 1666. 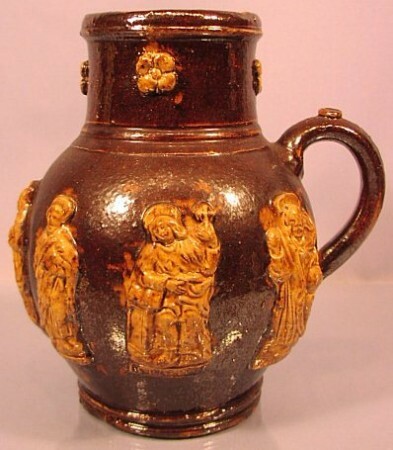 Just above : A much nicer example, Circa 1660. 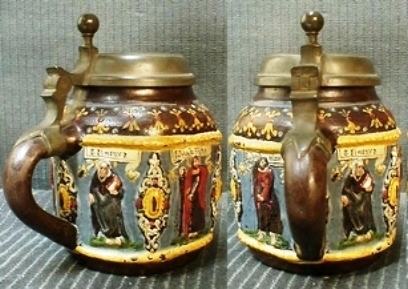 Apostelkrug made by P. Spielbühler of Thurnau, Bavaria, 4.5-inch. Very modern, but I think nice looking. 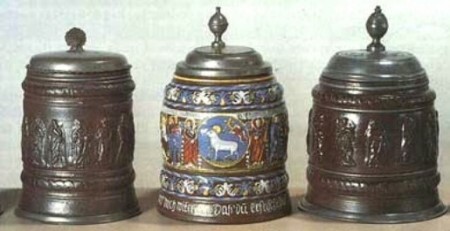 All three shown above are from Creussen in the late 1600’s. 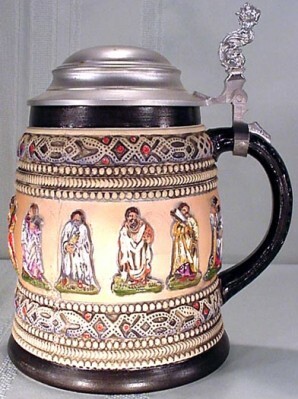 These are also called Apostle steins as those are the Saints that are featured. Of course the colored version now sells for lots more than the plain brown relief. 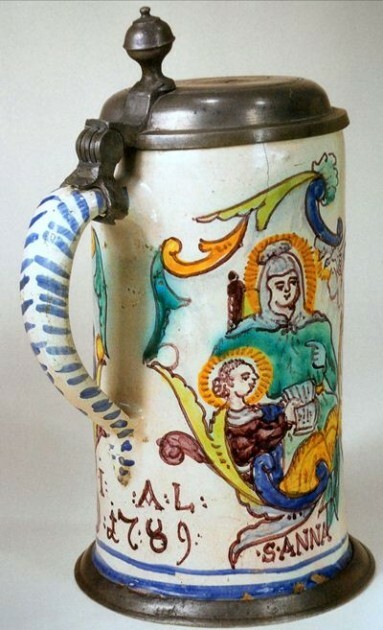 An unpainted one liter example of an Apostle’s stein, now in the FWTD collection. 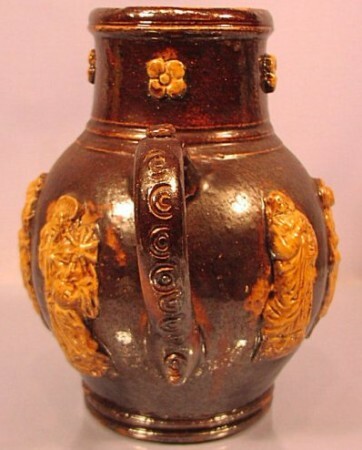 The reddish-brown c0lor threw a lot of collectors “off” of this one,….. which was fine with me! 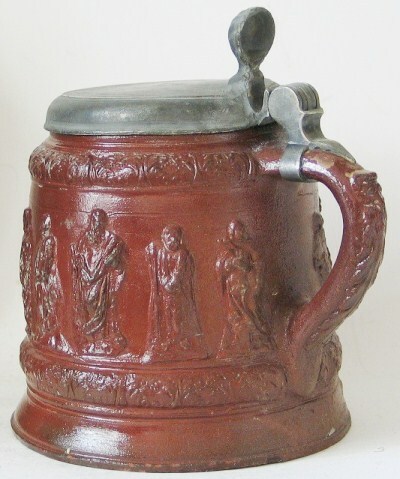 .5 liter Apostle’s stein. Newer version, Unknown maker. 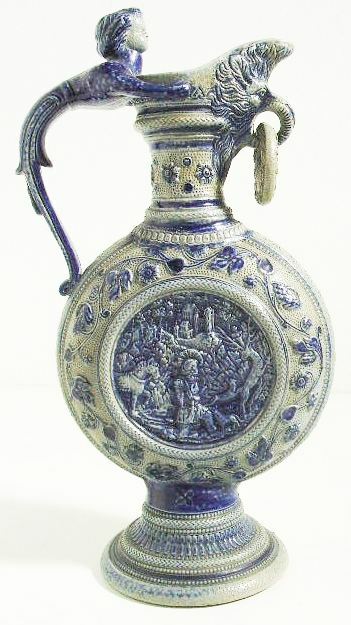 Circa 1890. 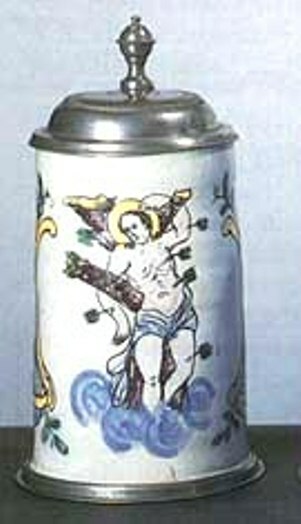 A new “limited edition” of an Apostle’s stein. Made by Gerz. 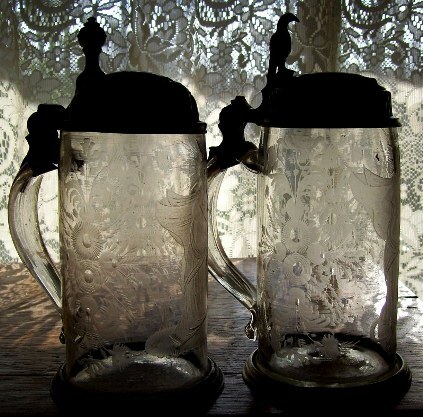 Steins devoted to one’s favorite or named sake Saint have been around for hundreds of year and as one will see they are made in just about every material one can imagine, except perhaps serpentine / marble. 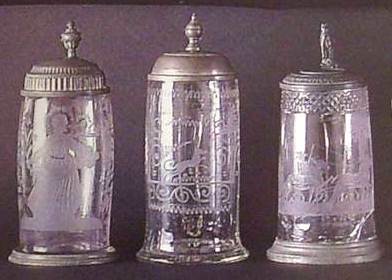 The ones I prefer to collect are the old glass steins with engraved images, and many of those are posted here on this page. 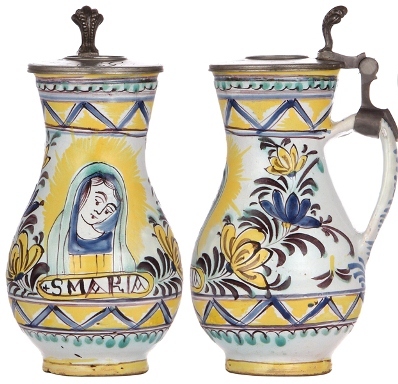 These were made originally for a person’s favorite saint, birthday of a saint, or “middle named as a Saint, especially for “Conformation” (a ceremony of coming of age to” believe” for one’s self) when a child take the name of a favorite Saint and adds it to their own. 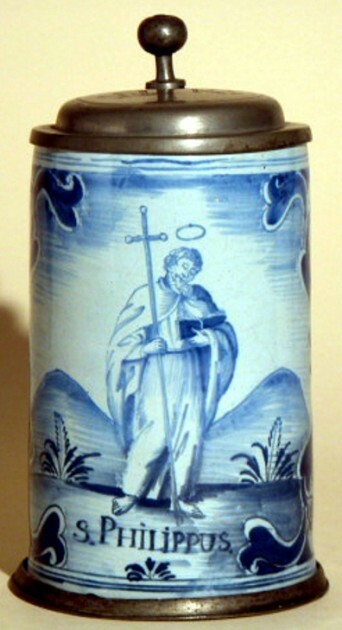 I know that no one except Catholics and other Orthodox religions (and people brought up under those religions by their parents) know virtually nothing about” Saints.” So I will on these pages try to endeavor to alleviate that problem by showing representative samples for all the “major old Europe saints” that might be depicted on beer steins. 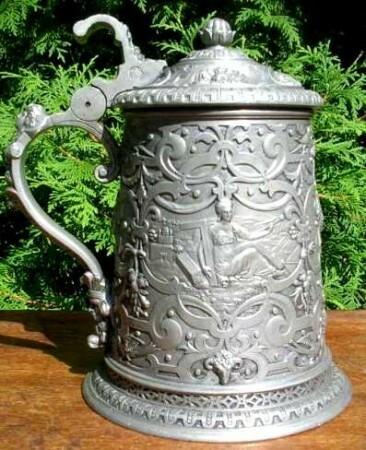 Hopefully this file will be used by some of the USA stein auctioneers who constantly do not know (or probably care) what they are looking at when they are describing a stein for sale. “St. 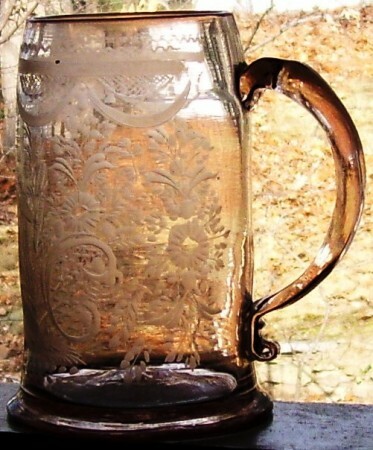 Andrew”  – Shown: 1/2 liter blown glass with air bubbles in the base, rough pontil mark, and a small lion thumblift. Ca. 1830 -40. St. Andrew’s attribute is of course the “X” cross. 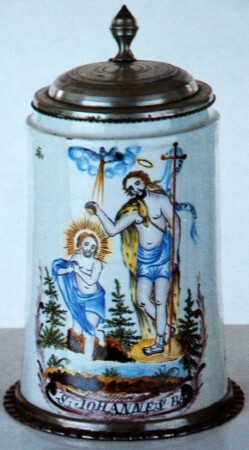 St. Andrew - The almost identical scene of St. Andrew on a fayence stein shown in a J.Vogt (Munich) catalog. “St. 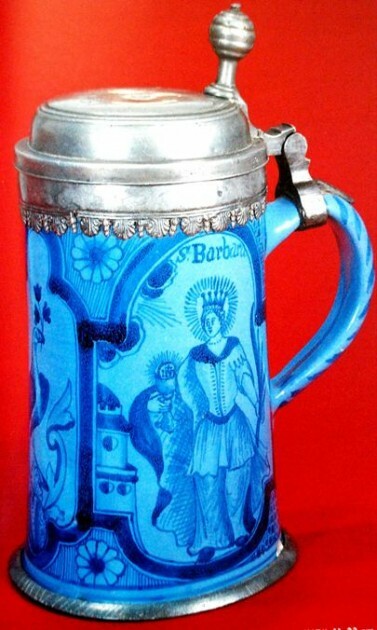 Barbara”  – St. Barbara was a (Legendary) virgin and martyr, first mentioned in the early seventh century. 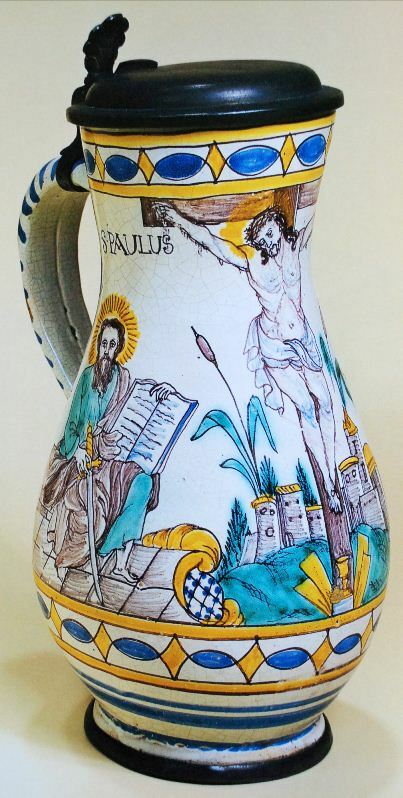 Alleged to have died in the third or fourth century, but date is uncertain and place of martyrdom varies. 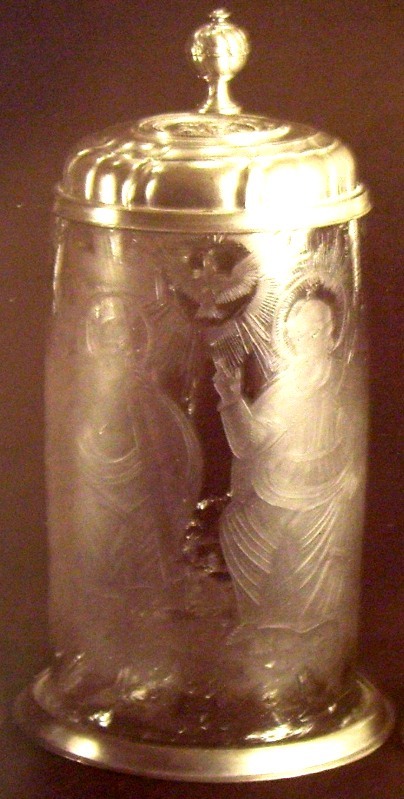 Shown: .5 liter blown clear glass, air holes in the bottom. 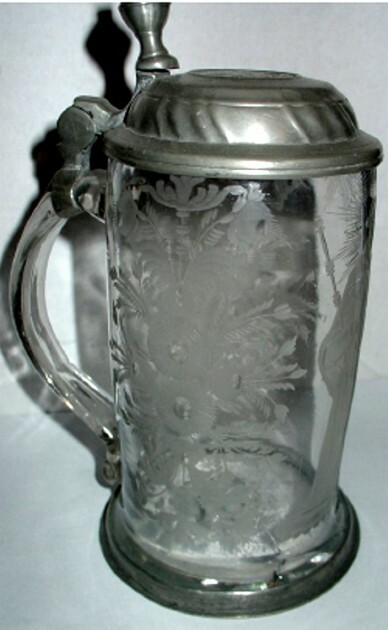 Circa 1830. The remaining gold leaf make it difficult to photograph. 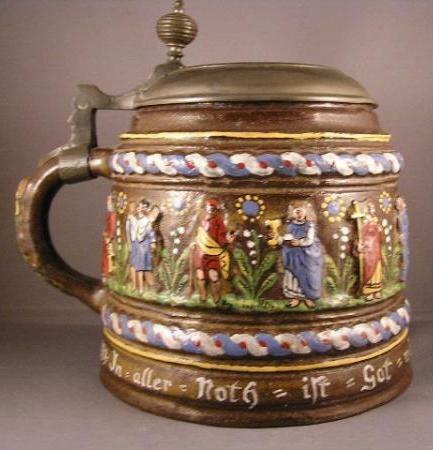 Almost all these type steins had gold leaf applied when new. 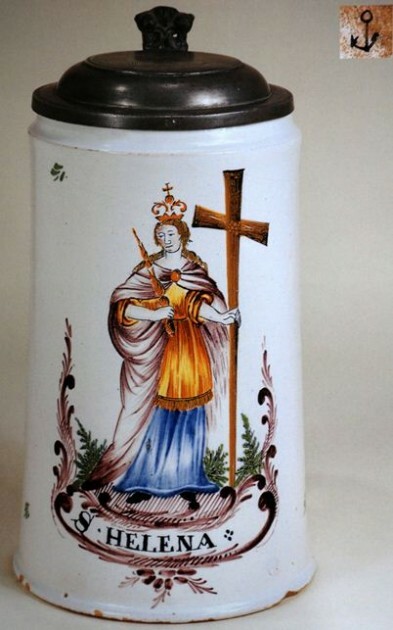 St. Barbara is also the Patron Saint of Artillery and can be found in small relief thumblift on some Reservist steins. 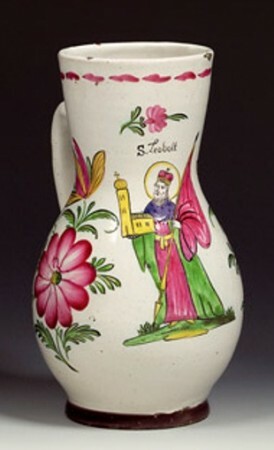 St. Bartholomeus (St. Batholomew)  – Bartholomew, Saint – Mentioned in the lists of apostles in the Synoptic Gospels and in Acts, thought to be identical with Nathaniel (mentioned only in the Gospel of John.) 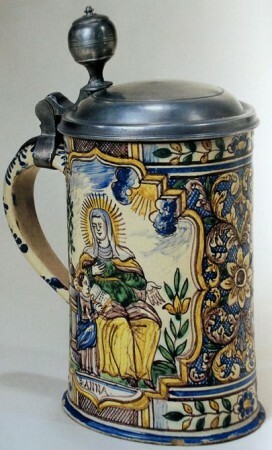 Shown above: One liter fayence from TBD. “St. Bernard [? ]”  – Bernard was Archbishop of Vienna, France. Born in 778; died at Vienne, 23 January, 842. His parents, who lived near Lyons and had large possessions, gave him an excellent education, and Bernard in obedience to the paternal wish, married and became a military officer under Charlemagne. 11-9-2012 = photo missing – some how “Word Press” did it again! 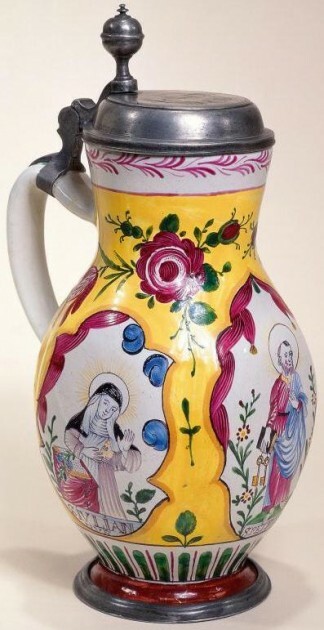 I believe this one and the one just below could be St Bernard also..
St. Catherine was a virgin and martyr whose feast is celebrated in the Latin Church and in the various Oriental churches on 25 November, and who for almost six centuries was the object of a very popular devotion. 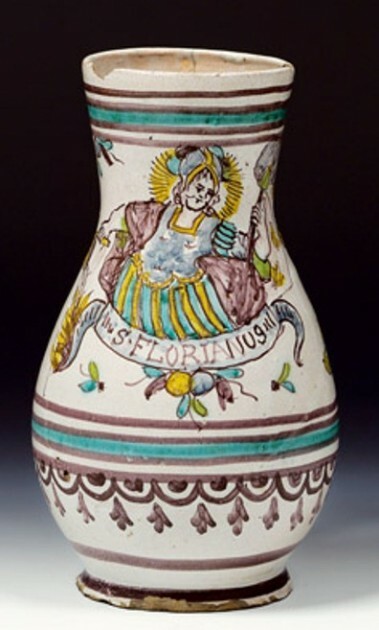 Of noble birth and learned in the sciences, when only eighteen years old, Catherine presented herself to the Emperor Maximinus who was violently persecuting the Christians, upbraided him for his cruelty and endeavored to prove how iniquitous was the worship of false gods. 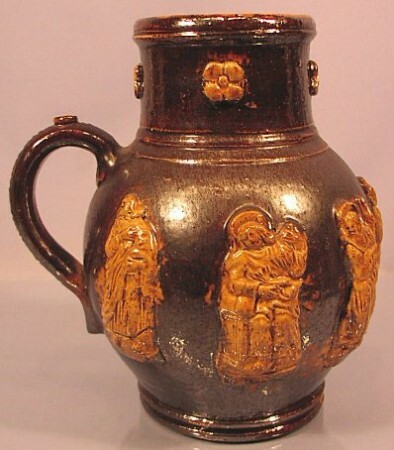 Maximinus had Catherine scourged and then imprisoned.Meanwhile the empress, eager to see so extraordinary a young woman, went with Porphyry, the head of the troops, to visit her in her dungeon, when they in turn yielded to Catherine’s exhortations, believed, were baptized, and immediately won the martyr’s crown. 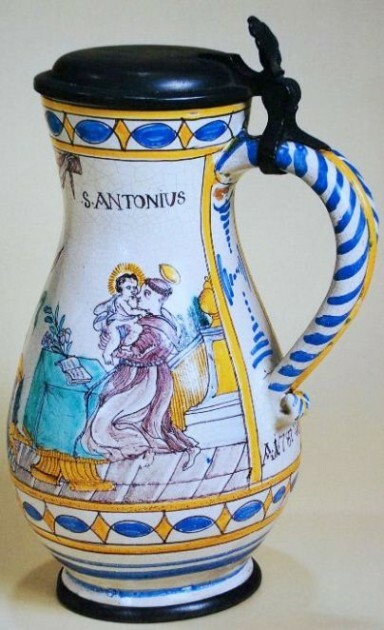 Soon afterwards the saint, effected so many conversions, was condemned to die on the wheel, but, at her touch, this instrument of torture was miraculously destroyed. The emperor, enraged beyond control, then had her beheaded and angels carried her body to Mount Sinai where later a church and monastery were built in her honor. 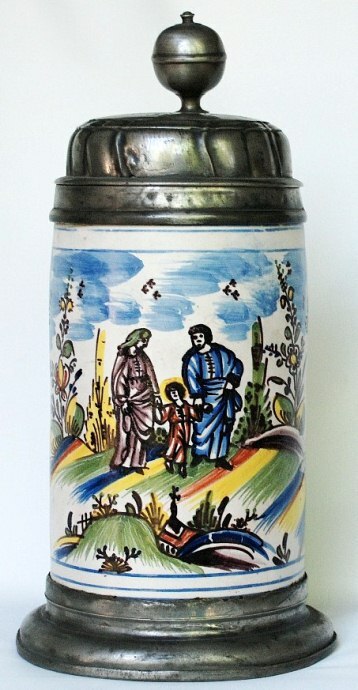 St. Florian  -The one liter V & B Mettlach, No. 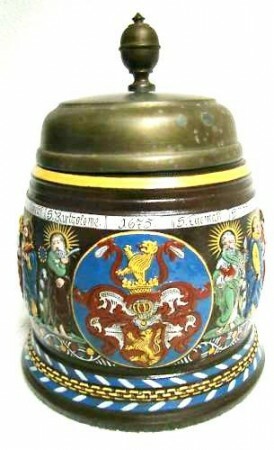 1786, celebrating St.Florian putting out a burning town (“thirst” in the phrase on the body) with a keg of beer. 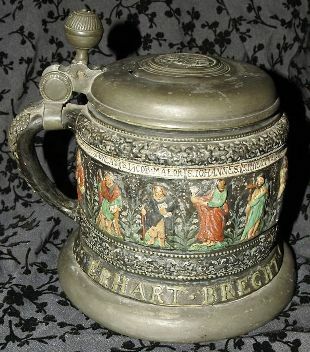 One of the most popular steins made at V &B, Mettlach. 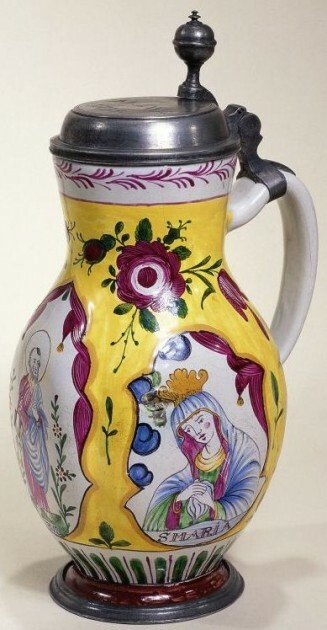 It was made in a .5 liter and a one liter size. 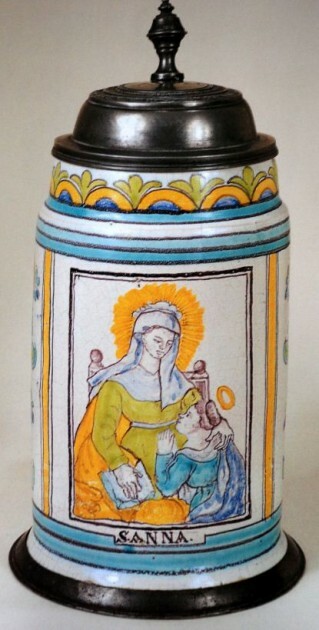 St, Gabriel – The Angel Gabriel – Fayence, 1 liter. Erfurt. 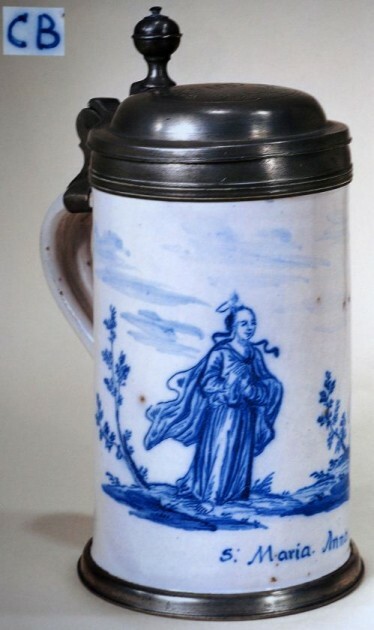 Circa 1800. 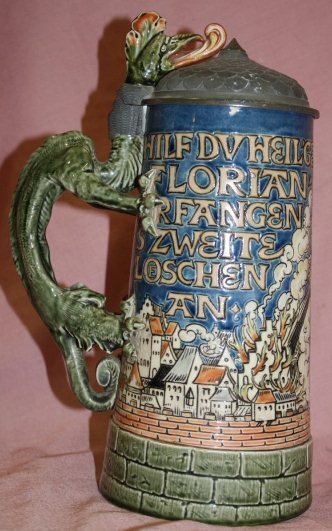 THERE ARE A MULTITUDE OF BEER STEINS DEVOTED TO ST. GEORGE, TO SEE MORE GO TO THE END OF THIS PAGE AND I WILL HAVE THEM DISPLAYED THERE. 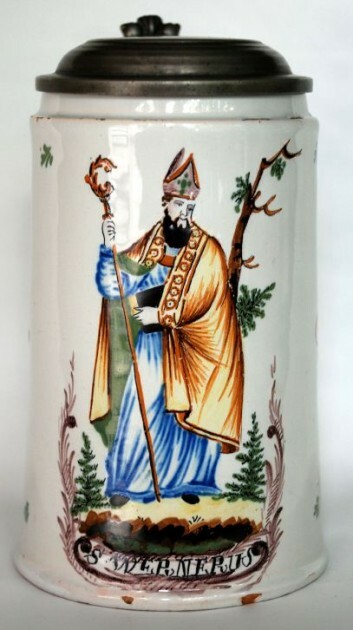 “Saint Hubertus” [1a] – Legend has it Hubertus, born in the seventh century, seeks comfort and distraction on lonely hunts after the death of his beloved wife Princess Floribana in childbirth. One Christmas Eve, he encounters on one of these hunts, the wondrous image of a splendid red albino stag carrying a shining cross between its antlers. Through this vision, Hubert is moved to transform his life. He lays down his high ranks of office and distributes his wealth among the poor and the church. 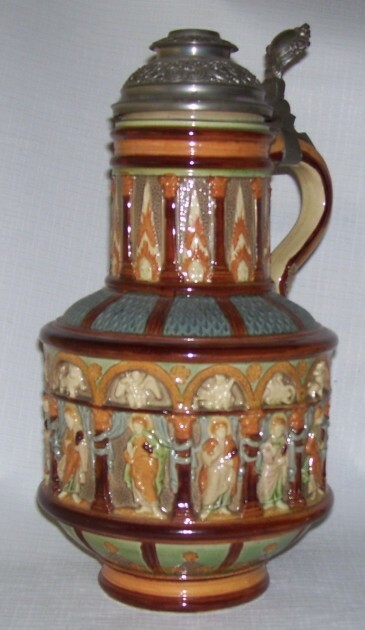 Shown: A Westerwald saltglazed stoneware relief “wine/ beer jug. 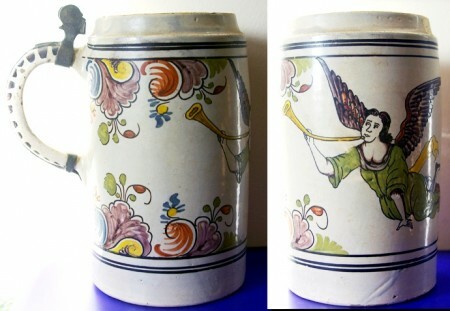 About a 3 liter I think. Circa 1885. 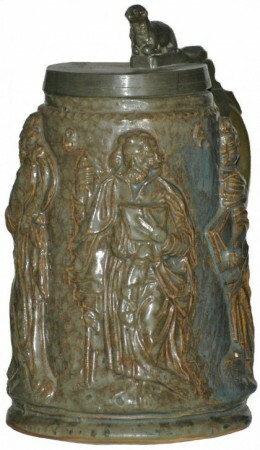 St. Hubertus [1b]- Detail of center scene. 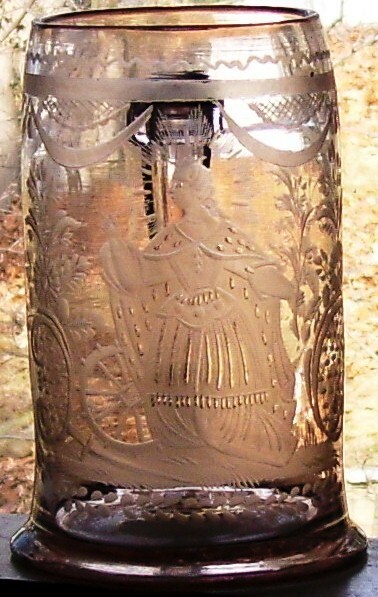 Shows the cross between the antlers. 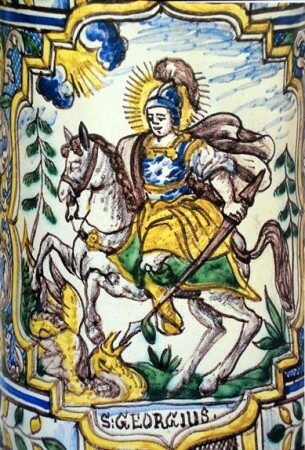 St. Hubertus has been the patron saint of hunters and animal protectionists (Tierschutzverein) in northern Europe who attempt to honor him by sharing their feasts with townspeople, holding charity fundraising festivals and being responsible for the care of animals on their lands, both domestic and wild. 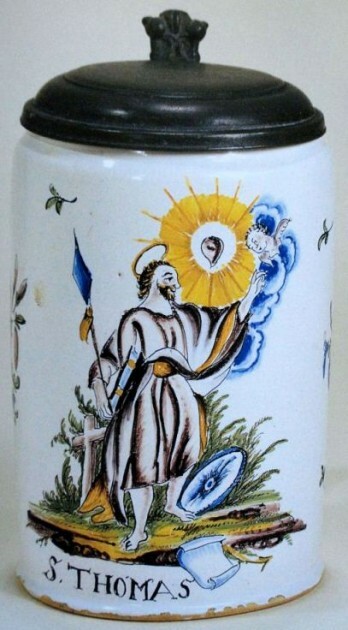 St. Isadore  – He was accused by his overseer of taking off time from farming to go to church St. Theodor denied it. 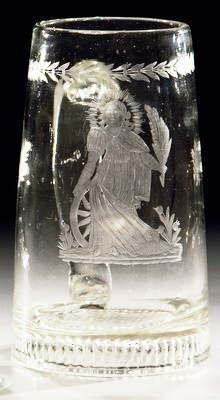 The oversee then went to the far fields only to see an angle working the plow for the saint. 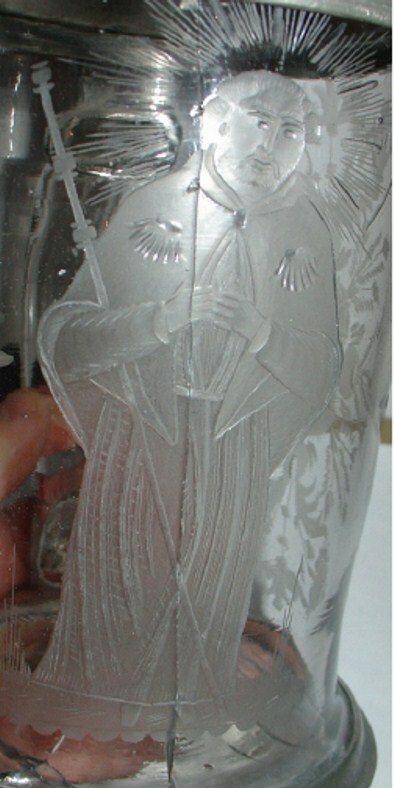 Shown : 1.5 liter pewter server by Weygang with the Angel(unknown which one) shown in relief on the lid’s shield and St. Theo as a small person in the background. Circa 1890. 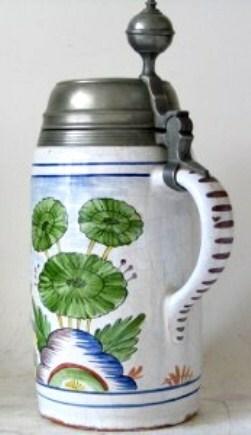 [ L] Detail – Used in SCI’S magazine PROSIT, Spring 2009, I emailed at least twice and asked for some detailed photos of this stein from the “well know author” of the article. I might of well have asked one of the squirrels outside on my lawn! Thanks a bunch, Steve…. NOT! 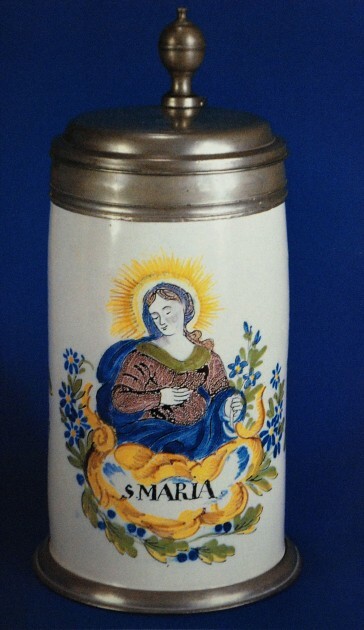 [ R] St. Margaret (the exact stein as shown two above.) 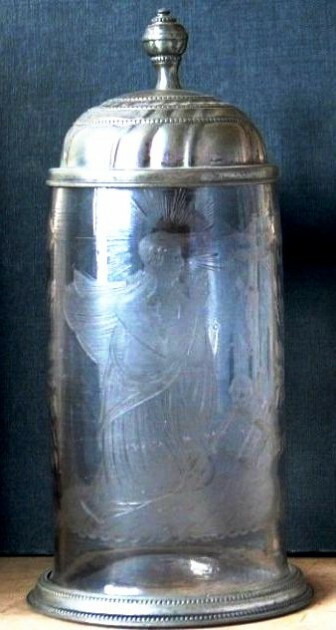 [L] St. Mary Magdalene –– see below). 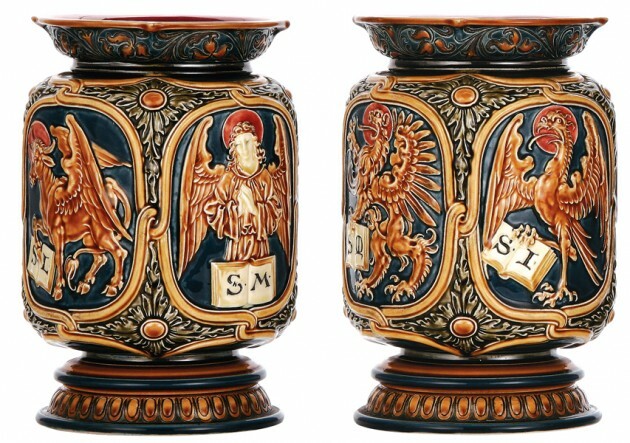 Both were engraved by the artist I call “The Master of the Engraved Saint’s Steins: (TMOTESS)” whose work is in the Bavarian (National) Museum. “St. 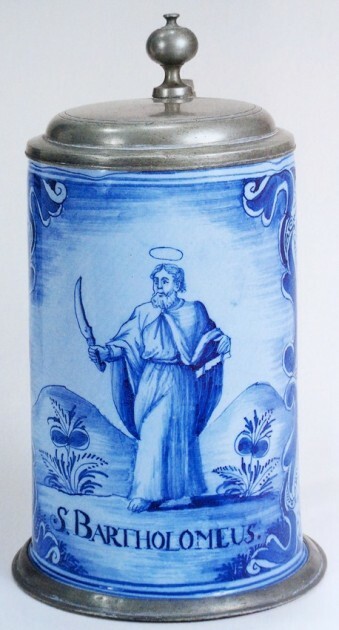 Martin”  – St. Martin who is shown here cutting his fine cloak for a beggar. 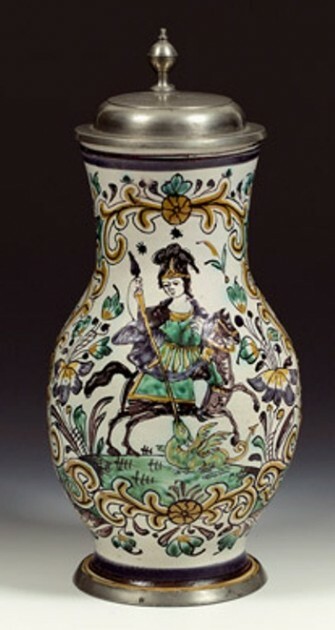 This scene was cataloged as “A knight on his horse” by a us stein auctioneer not too long ago. “St. 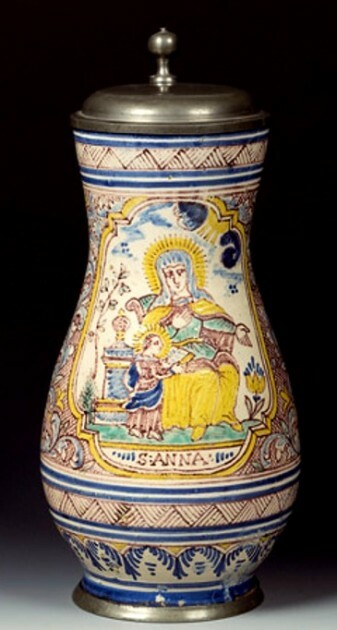 Mary Magdalene”  – Mary Magdalen was so called either from Magdala near Tiberias, on the west shore of Galilee, or possibly from a Talmudic expression meaning “curling women’s hair,” which the Talmud explains as of an adulteress. 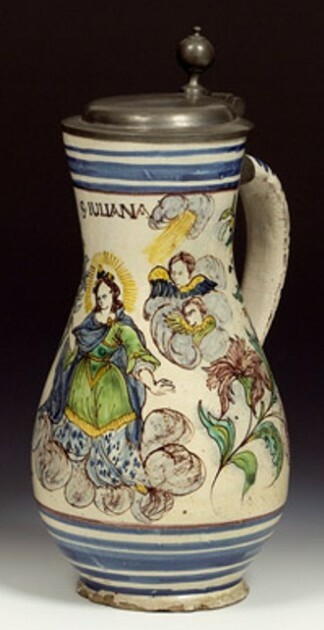 In the New Testament she is mentioned among the women who accompanied Christ and ministered to Him (Luke 8:2-3), where it is also said that seven devils had been cast out of her (Mark 16:9). She is next named as standing at the foot of the cross (Mark 15:40; Matthew 27:56; John 19:25; Luke 23:49). 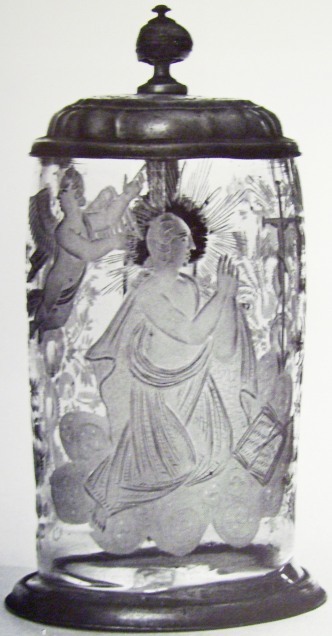 She saw Christ laid in the tomb, and she was the first recorded witness of the Resurrection. Shown: “St. 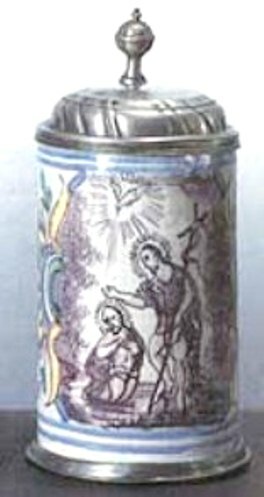 Mary Magdalene,” done by the artist I call “The Master of the Engraved Saint’s Steins, (TMOTESS)”. 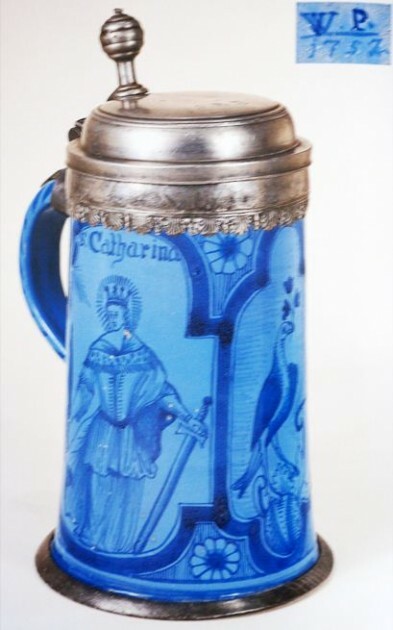 This stein is in the Bavarian National Museum. 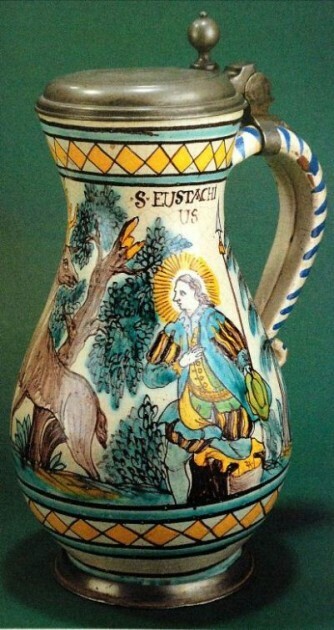 Circa 1790. I believe this is a one liter size. While hard to see, her two attributes, an open book (the Bible) and the cross are shown on both. 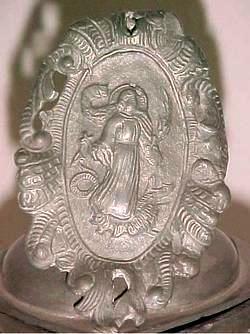 St. Mary Magdalene  – Shown: Pewter relief, 1/2 liter (replica of an older 1600’s piece) but this one made in the late 1800’s. 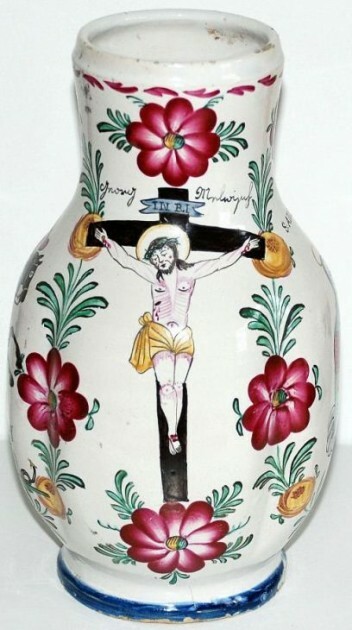 She is holding onto the cross with the skull (one of her attributes) by her feet. 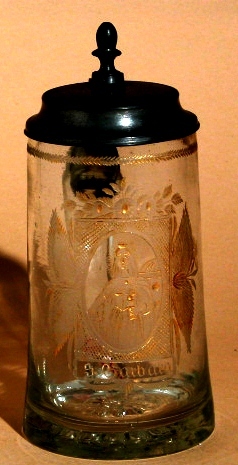 St. Michael, The Archangel – Engraved with applied gold leaf. 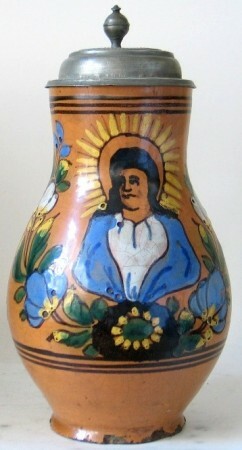 Bohemian Ca. 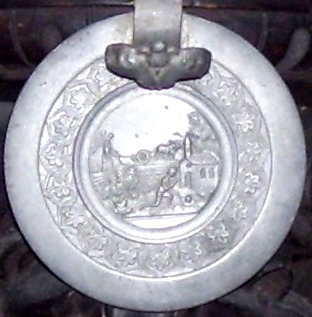 1820. 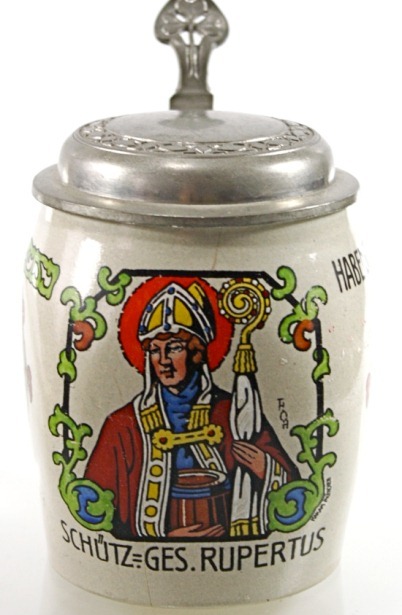 St. Rupert – First Bishop of Saltzberg, coming from the Bishopric of Worms. 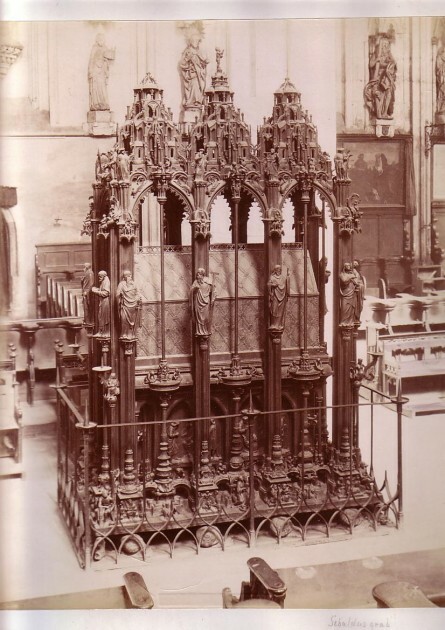 St. Sebaldus’ tomb in Nurnburg. 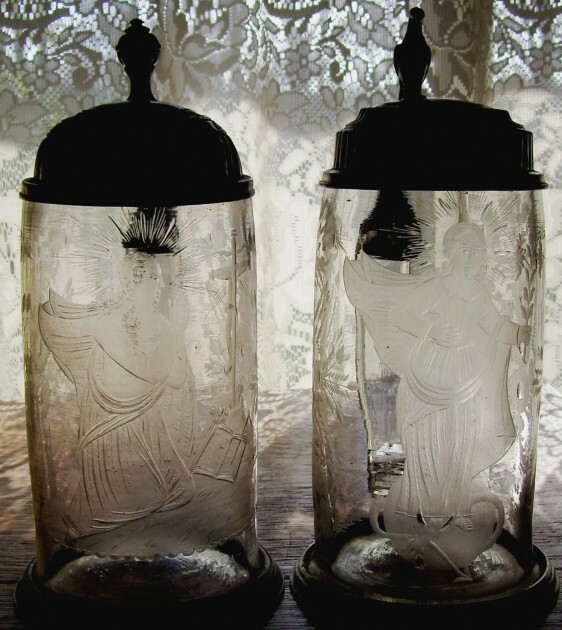 St. Sebastian – [photo: JV] –Roman martyr; little more than the fact of his martyrdom can be proved about St. Sebastian. The Acts, probably written at the beginning of the fifth century and formerly ascribed erroneously to Ambrose, relate that he was an officer in the imperial bodyguard and had secretly done many acts of love and charity for his brethren in the Faith. When he was finally discovered to be a Christian, in 286, he was handed over to the Mauretanian archers, who pierced him with arrows; he was healed, however, by the widowed St. Irene. He was finally killed by the blows of a club. These stories are unhistorical and not worthy of belief. The earliest mosaic picture of St. Sebastian, which probably belongs to the year 682, shows a grown, bearded man in court dress but contains no trace of an arrow. It was the art of the Renaissance that first portrayed him as a youth pierced by arrows. 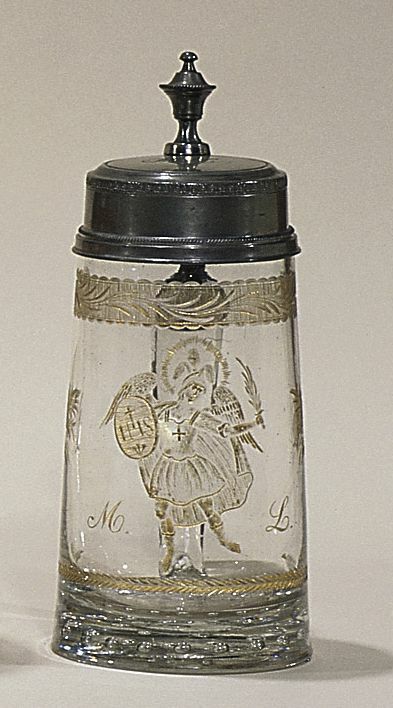 Sebastian is considered a protector against the plague. Celebrated answers to prayer for his protection against the plague are related of Rome in 680, Milan in 1575, and Lisbon in 1599. 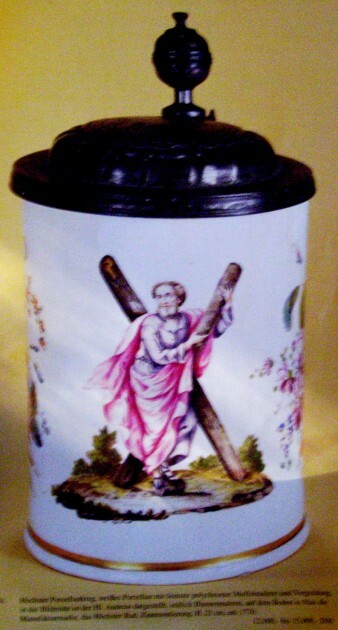 His feast day is 20 January. 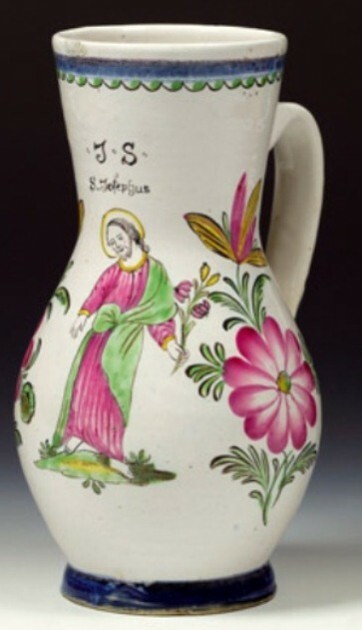 UNDETERMINED SAINTS – CAN ANY OF YOU READERS HELP ME OUT? 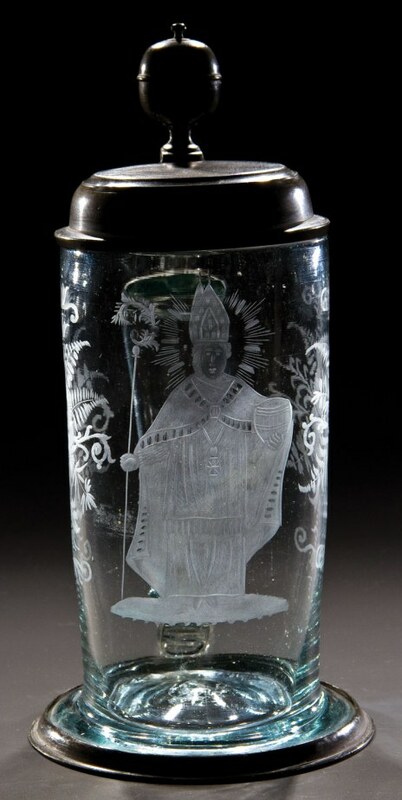 An unknown Bishop / Saint on an engraved clear glass stein from about 1760-90. The Trinity: The Father, Son and Holy Spirit. 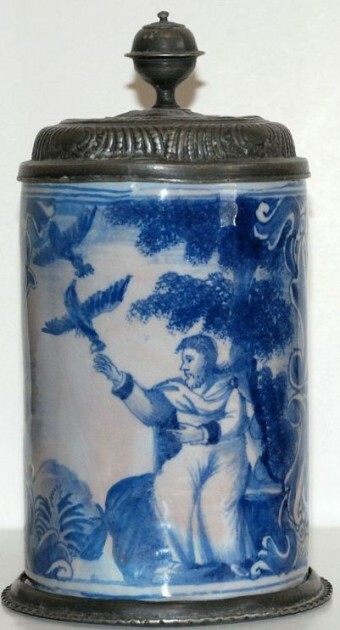 Faience stein, 1.25L, 10.7 ht., Loebersdorf, late 1700’s . 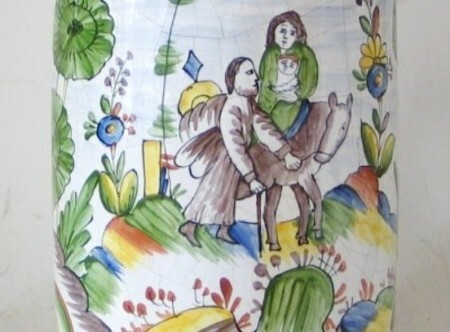 Detail of the Holy Family on their trip to Bethlehem, on a circa 1950-80 fayence piece. Induced crazing, but still nice workmanship. MULTIPLE SAINTS – When several saints are pictured they are usually those saints known as the Apostles (The Apostles – Apostolos (Apostle) means one who is sent forth, who is entrusted with a mission) or the four evangelists who wrote the gospels = Matthew, Mark, Luke, and John. 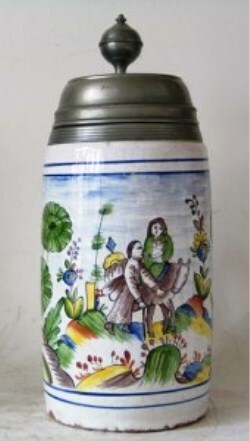 A large RussianBratina or friendship cup (really it is a small bowl as it has no handles) with a bulbous middle. 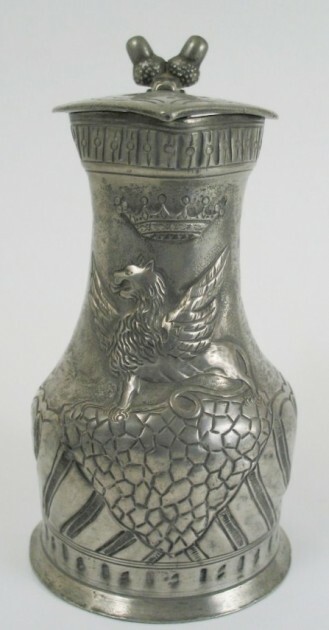 Made in all metals, but mostly silver with enameled designs. 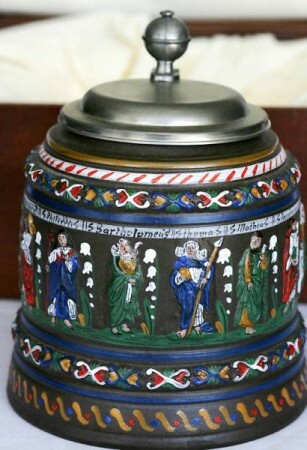 Above: A baked enamel, copper based, Bratina, from the 1600’s with symbolic scenes of Matthew, Mark, Luke and John. 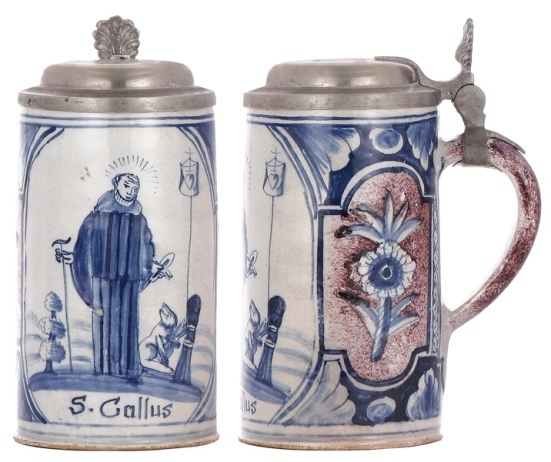 Above: two late 1800’s reproduction Apostle steins. [L] Saltzer factory. [R] Unknown. 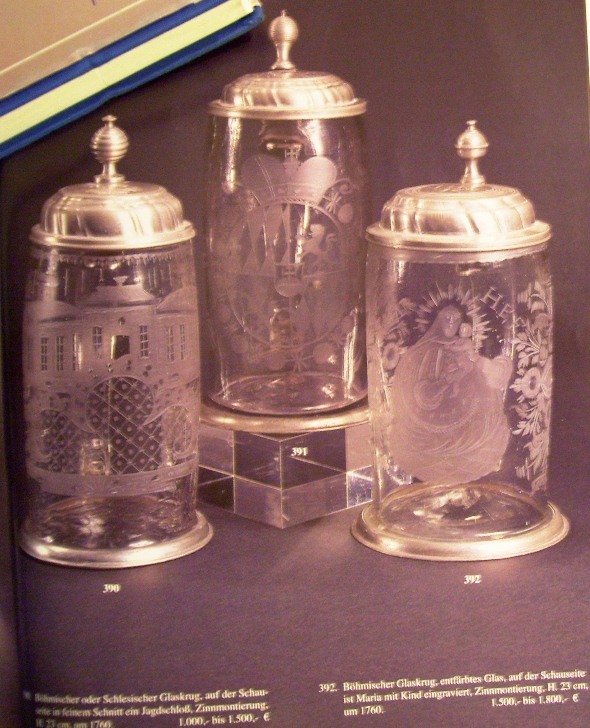 Because the originals are now too expensive for most, eveen the 1880-1900 reproductions are getting good money. 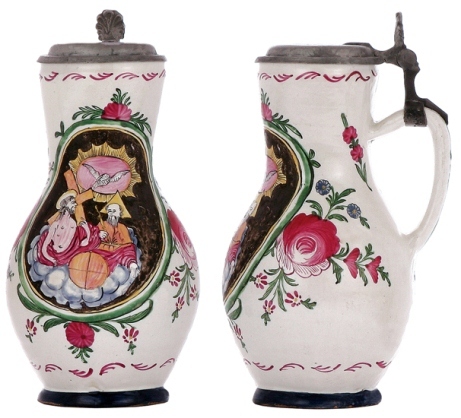 The stein to the left (by A. Saltzer) would probably bring $900 to $1100 at auction today. It is extremeely well made. 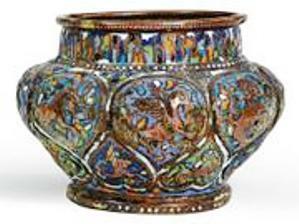 BUT some are not and have lost a lot of their enameling. And breathe a prayer for his soul. Like dew-drops in the grass. Who had preached his holy word. They remembered one Saint more. But the Abbot was stark and dead. Had sunk and dissolved his soul. 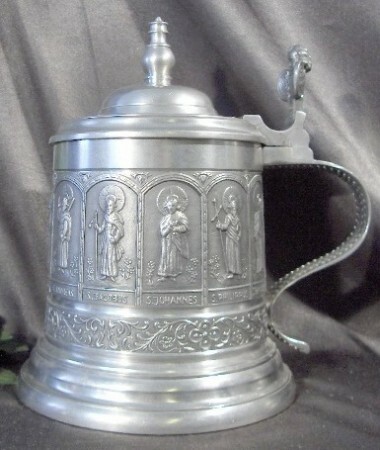 For they cried, “Fill high the goblet! …………………………. 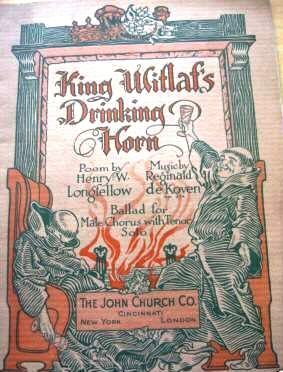 Written by: Henry Wadsworth Longfellow.